Keeping your ice safe from contamination is important in any restaurant and at any catering operation. Toting ice in pickle buckets is a practice of the past! Supplying your staff with at least one dedicated Ice Tote is an absolute a necessity. San Jamar, experts in food safety and sanitation, offers ice totes that will significantly reduce the chance of ice contamination. 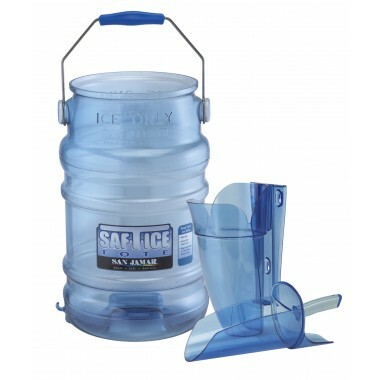 The Saf-T-Ice™ tote has several features and benefits, such as non-nesting, clean pour, raised grips and snap tight lids. These “ice only” totes will help insure the cleanliness and safety of your ice and beverages. Keep your ice safe all the way into the glass...Ask your myBoelter representative about ice tote and ice scoop combo packs.